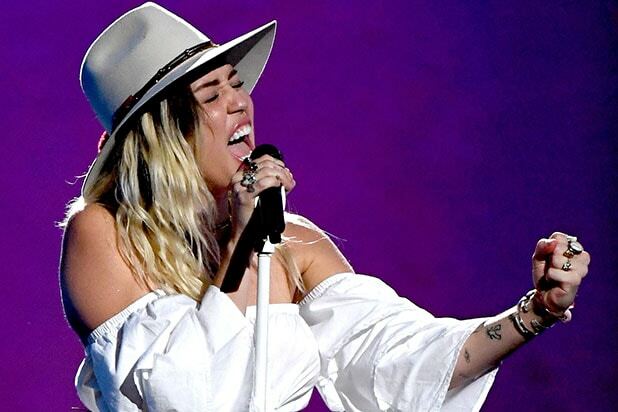 Miley Cyrus got pretty emotional during her performance of her new hit, “Malibu,” at the 2017 Billboard Music Awards on Sunday night in Las Vegas. Cyrus was introduced by her father, Billy Ray Cyrus, and her younger sister, Noah Cyrus, before the 24-year-old took the stage. Noah Cyrus joked that the singer was finally wearing pants for a performance. Cyrus dropped the new song on May 11, and people immediately praised Cyrus for heading back to her country roots after she sparked multiple headlines over the past years with her raunchy antics. Earlier this month, Cyrus revealed she was going back to basics with her new album, which includes no strap-ons, no giant teddy bears and, for now, no more weed. The new single is part of her still untitled upcoming album. “Malibu” is about her fiance, Liam Hemsworth, with whom she just reunited last year after the couple’s breakup in 2013. Watch the end of Cyrus’ performance of “Malibu” below.